If you were hoping for the production versions of BMW's first production EV and sports plug-in hybrid, you're out of luck, but if BMW keeps up its recent practices, the concepts unveiled today will be very close to the final cars. 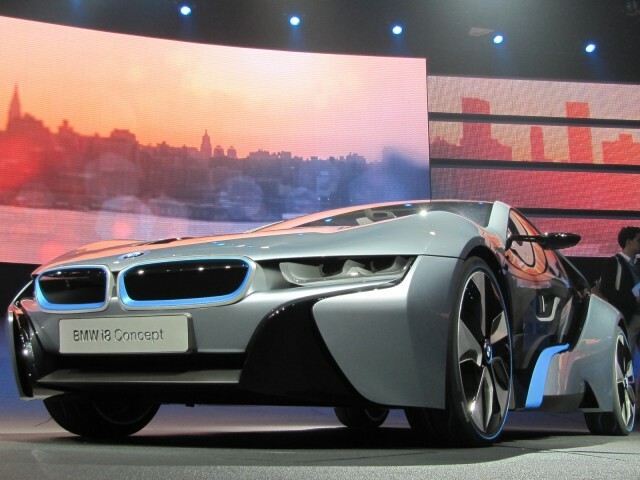 These live photos from the unveiling in Frankfurt should give you a better feel for what the i3 and i8 are really like. Powered by an electric motor driving the rear wheels through a floor-mounted battery pack, the i3 features some radical design elements, including mostly-glass scissor doors that open upward rather than to the side--in theory, to enable easier entry and exit in tight urban spaces. The same glass scissor doors feature on the plug-in hybrid i8, though its supercar-like profile and equally radical body work give it a decidedly more sporting look. Jump over to AllCarsElectric for the full details on the new BMW i3 electric city car and i8 plug-in hybrid.